Treat yourself to something tasty when you order from Kelly’s Roast Beef. With five locations throughout Massachusetts, we are proud to be your source for fresh and delicious dishes that the entire family will love. Our local restaurant uses the freshest ingredients available to prepare meals that fit every diet. Whether you are craving a famous lobster roll or our legendary roast beef, you are sure to find something on our menu that delights your taste buds. At Kelly's Roast Beef, the answer is always yes. Delighting guests is our passion, even if it means bending over backwards. Our famous roast beef, succulent lobster rolls, and crispy fried seafood are always made to order. No matter what you're craving, you can count on us to prepare your meal with premium ingredients. Do you have a special diet? Whether you are sensitive to gluten or looking for a guilt-free option, we are happy to tailor our menu selection to fit your specific dietary needs. All of our meals can be customized to anyone’s health-conscious or diet restricted needs, so just ask! We’re happy to make it happen. Consumers have become savvier about healthy eating options and so has Kelly’s! Since our inception, we have expanded our menu with a range of delicious and healthy items all prepared to order. Now you can enjoy your favorite foods without the guilt. No mayo? No problem. Our menu includes everything from crisp vegetable salads and freshly rolled wraps and sandwiches made with lean delicious meats to low-calorie seafood that is delivered fresh daily. 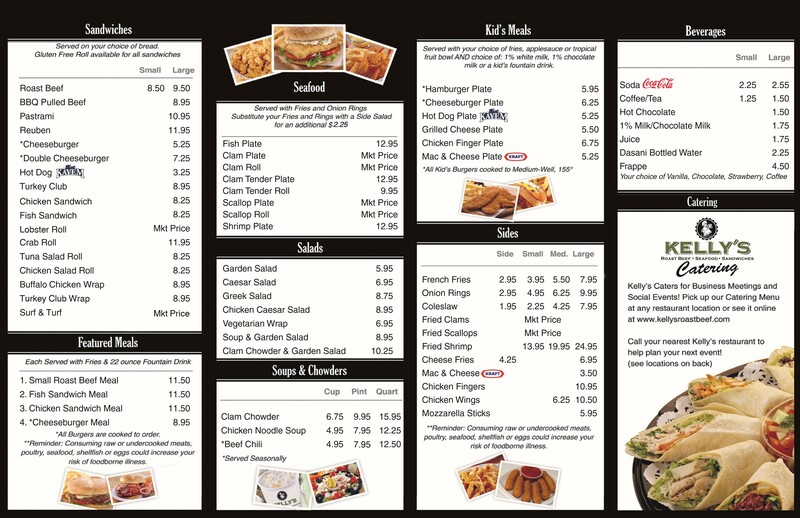 Feel free to customize any of our selections for the taste you want for every meal! Enjoy a fresh meal for every craving when you visit Kelly's Roast Beef. Our local restaurant features five locations throughout Massachusetts.